Is your company on the fence about whether it’s time to switch to Office 365 hosting service? If so, you are not alone. Many businesses are mulling of the pros and cons of Office 365 to determine if making the switch is the right option for their specific business. At first glance, the subscription-based platform Microsoft 365 certainly seems to have a lot to offer, such as continuous updates and low subscription fees. However, Office 365 is not without its drawbacks. Below is a look at the top five drawbacks of Microsoft 365 hosting that you should consider carefully before making your decision. One of the biggest drawbacks of Microsoft 365 is the lack of data privacy. Microsoft has certainly gone out of its way to create a very secure platform that provides a high level of data protection. It does, however, take the control of maintaining and monitoring data security out of your hands and into the hands of Microsoft. For many companies, this obstacle is too great to overcome and it even may go against company or governmental regulations, which makes Office 365 an unrealistic option. Office 365 offers some very low initial subscriptions plan rates. This may sound like a great deal, but there’s more to consider. First, this initial low-cost plan is very limited and likely will not provide all the services and capabilities your business requires, even if you operate a small business. In order to have the types of services your business needs, you can expect the rates to be much higher. Even more troubling is the lack of support that Microsoft includes in their hosting packages. You have to solve the problems yourself using their Office 365 community which is filled with both correct and wrong answers. Microsoft almost expects you to hire or have a knowledgeable IT person in your company to manage the Office 365 service. In the end, you could end up spending a lot more with Office 365. Since Office 365 is created for a wide range of customers, it does not offer the same level of flexibility. This lack of flexibility can make it more difficult, or even impossible, for your business to customize these services to meet the unique demands of your business. It is crucial that you take a close look at the various features that Office 365 offers to ensure that it offers everything you need to continue meeting the needs of your business’s day-to-day operations. Another major drawback is the limitations that come with Office 365. Perhaps the most alarming limitation is that the platform limits the amount of emails you can send and receive on any given day. It also limits how long you can retain and archive older emails. This could be a major problem for companies that send or receive a large volume of emails on a daily basis, as well as companies that require email to be saved for a long period of time. Companies that are overburdened with maintaining Office data may find it refreshing to have Microsoft control management and security. However, this level of control does not come without drawbacks. You will find that Microsoft has set up a series of safety and management regulations. These restrictions could interfere with your company’s daily activities. For example, Microsoft does not allow the importation of XML files. If your company uses these types of files on any basis, it may be impossible to switch to Office 365. As you can see, there is a lot to consider before deciding if you should switch to Office 365 or not. Managed Microsoft hosting services may be the perfect alternative for your business. Hosting companies such as Access Hosting offer low-cost services that provide a greater level of flexibility and customization to ensure your platform meets the specific needs of your business. There are few things more valuable to a business than properly onboarding and training new employees. While for most companies the ROI on hiring and app developer for a training application wouldn’t be high enough to justify the cost, building them in house is an appealing option. And as the company’s hiring scales, moving the backend of the app to a server like Microsoft SQL Server will be a low-cost way to scale your training app with it. For many small businesses, CRMs like Salesforce or Microsoft Dynamics are either too expensive or too cumbersome to implement. However, having accurate, up-to-date customer and prospect information is crucial to running client-facing departments . As an MS Access user, it’s more than likely that much of this data already exists there. By standardizing this information and creating relational tables for objects like leads and deals, you too can have a CRM without the cost and learning curve. While we’re on the subject of prospects and customers, many of them will want to access some of the data that you store in your web database – for example, recent invoices or the date of their next appointment. You can easily deliver this data easily by offering them a form they can fill out on your site. ASP.NET forms can query a Microsoft Access online database directly, so by implementing them on your site, you can surface this data to your customers with limited effort from your developers. If you’re like many, you’re using an endless string of VLOOKUPs in Excel to report on related data from different tables or sources. This is really a job for Microsoft Access’ relational tables. Built on top of Microsoft’s Jet Database Engine, you can use these powerful tools to easily create queries that quite literally fly. If you’re in software development, one common practice you’re likely familiar with is creating waterfall models to manage the progress of an application. Since you may be creating an application that leverages Access or SQL Servers as your backend, why not keep track of your app’s progress there as well? These are just a few of many ideas for uses for MS Access – the beauty of the software is that it’s uses are really only limited to the imagination<. You’ll notice a text box on the ribbon in Access 2016 that says Tell me what you want to do. This is a text field where you can enter words and phrases related to what you want to do next and quickly get to features you want to use or actions you want to perform. You can also choose to get help related to what you’re looking for. Can’t find a button? Click inside the Tell Me box (it’s the box at the top, with the light bulb). Type a button or command, like “filter”, and you’ll see all of your filter-related options listed for you. Keep in mind that the the Tell Me box is not available in the ribbon when designing Access web apps. Have you ever wanted to get a nice list of all the linked data sources from your Access database application into MS Excel? If you are working on a complex Access application, for example, that includes links to many different data sources, it can be helpful to have a nice list of all the various data sources and their types. This exported list can be especially helpful if you are working on an Access application you did not originally design. Now with Access 2016, you’ll find this task much easier using new functionality built into the Linked Table Manager dialog. Once again, please note that this feature is not available when designing Access Web Apps. Are you seeing a trend here? In Access 2016, the default height of the Show Table dialog has been increased so you can easily see more table and query names in your database. To view the Show Table dialog in queries, click Create > Query Design. The Show Table dialog opens by default. You can also open this dialog in queries by clicking Design > Show Table. 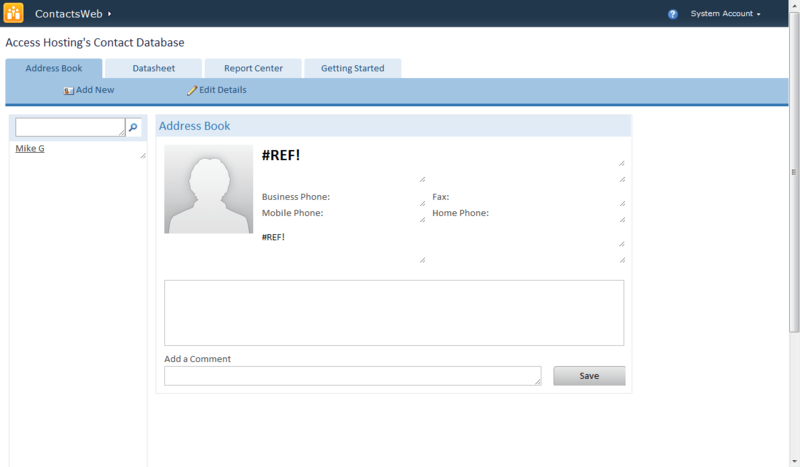 To view the Show Table dialog in the Relationships window, click Database Tools > Relationships. The Show Table dialog opens by default. You can also open this dialog in the Relationship window by clicking Design > Show Table. Once again, please note that the Relationships window is not available in Access web apps. As mentioned a lot of the improvements to Access 2013 come to aesthetics. There are now two Office themes that you can apply to the Access program: Colorful and White. To access these themes, go to File > Options > General, and then click the drop down menu next to Office Theme. Each of these templates includes a new Getting Started form with links to articles, videos, and other community resources. I was recently having a very good chat with a potential customer that had some very good questions regarding Access and Office 365. This person already had an Access app and was looking to share it online in the browser and was thinking that SharePoint was the best solution but was confused about what they needed exactly since they had an Office 365 plan with a few users with just email and a few more with Sharepoint and more. It was such a good conversation that I thought it would be good to clarify some of the differences between Office 365 and our SharePoint 2013 Enterprise hosting plan for Access Web Databases and Web apps. The most confusing part of the comparison is that the varying plans for Office 365 are quite confusing in and of themselves. Office 365 is a sort of all encompassing term used to describe a lot of different products from Microsoft. It can be as simple as a subscription to Microsoft Office software or a complicated enterprise plan with access to Exchange, Sharepoint, Yammer, and more. If you’re interested in Access Web Databases or 2013 Web Apps, the first thing to determine is whether your Office 365 plan even includes SharePoint Enterprise. You need to have either an Office 365 Business Premium plan ($12.50-$15 per user per month) or an Office 365 Enterprise Plan ($20 per user per month) to have access to the correct version of SharePoint with Access Services. Obviously if you have a small business where you have 10 users or less and need email, exchange and everything in between, Office 365 is the better deal, but for a lot of people they need something more flexible. Let’s say you have Office 365 and are paying $15-$20 per user and have an Access database that you want to host in SharePoint as a web app and share with some of your clients outside of your organization. How do you do that if they don’t have their own Microsoft account/Office 365 account? Our $99 SharePoint hosting plan has been tailor made for Access Services 2013 and 2010 and offers substantial cost savings over Office 365. Right off the bat our $99 plan includes 10 users ($50 – $100 less than Office 365), and each additional user is only $3 per user per month vs. the $15-$20 per user Office 365 plans. Best of all, you don’t need to pay for all the extra features of Office 365 that you don’t need for you and your clients. Another cool feature about our $99 Sharepoint plan is that you can run 2013 Access Web Apps right alongside Access 2010 Web Databases since our 2013 SharePoint environment is running both versions of Access services. We’ve already written about the differences of this technology in a previous post: picking between Access 2013 Web Apps and Access 2010 Web Databases. Web Based Reports: SQL Server Reporting Services can be used to create reports and link them back into the menu structure of the web app. Access 2013 web databases use the browser as the primary interface to the client. This environment provides an excellent cross platform solution that allows users to participate without a copy of Access on their desktop and create/read/update/delete records in the database, but it lacks a mechanism for reporting on that data. With SQL Server Reporting Services (SSRS) you have the ability to deliver browser based reports to your users alongside the Access 2013 web database forms. Anonymous Access: With this feature enabled Access web databases can be viewed by an anonymous read-only user without requiring authentication. We recently had a customer looking to provide an up to date inventory of their video game and pinball machine inventory to their web site visitors. With Access Services 2013 and anonymous access enabled inside the SharePoint web application, web visitors could view the entire catalog of available games and pricing information without authenticating to SharePoint. This is a powerful feature for any organization that wants to make their product inventory visible to any web visitor, delivering the information quickly and seamlessly without complicating the end user experience. Full control of SQL Server security: Access 2012 allows for the automatic creation of 2 SQL Server user accounts, one with read-only privileges and another with read-write. While that is useful, some customers would like to extend this model to multiple user accounts. By creating multiple SQL logins via SQL Server Management Studio (SSMS) you can create a much more complex security model for applications that want to leverage the Access 2013 web database information stored in SQL Server. Password complexity and aging requirements can also be enforced on these accounts. Full control of the network firewall: Many Access 2013 applications require extended security to comply with corporate or regulatory requirements. The Health Insurance Portability and Accountability Act (HIPPA) security requirements are a good example of this necessity. In a self-hosted or 3rd party hosted solution you have enough firewall configuration flexibility to lock down your entire database by imposing restrictions on the network perimeter based on TCP/IP address ranges, machine names, and network protocols. A combination of these restrictions can be imposed to address any security mandate. Render http links in the web browser control of an Access 2013 web database: The browser control is a powerful feature in Access 2013 web forms that allows you to call external resources into your application. Office 365 requires https for all external links which limits the use of browser based resources that do not support https. This restriction can be lifted in a self-hosted or 3rd party hosted configuration. Customized backup: You can create a backup rotation scheme in SQL 2012 for the Access Web Apps that mirrors the site collection backup routine in SharePoint. This allows for a synchronized full fidelity backup of the SharePoint site and the Web Apps with multiple restore points. We recently assisted a customer who required a complete snapshot of their SharePoint and Access Services environment to be available for rollback to 24/47/72/96 hour recovery points. In addition, the second and fourth snapshots needed to be available in a secondary data center in the event of a problem with the primary facility. All of this is easily accomplished in a hosted configuration where both the SharePoint and SQL Server environments are completely controlled by the hosting organization. Ability to change Access Services configuration parameters and SharePoint web application settings: When running Access Services 2010 alongside Access Services 2013 you maintain complete control of the SharePoint service parameters for Access Services. These parameters can be tuned to enhance the interaction between Access 2010 and SharePoint lists and eliminate the “List Threshold Exceeded” errors that can appear when using the default configuration settings and manipulating large tables. Full support for web based reporting in published Access 2010 Web Databases and permissive file handling for things like PDF can also be enabled when you have full control over the entire SharePoint Central Administration console. A lot of casual Access users don’t realize the immense differences between SharePoint Access 2010 Web Services and Access 2013 Web Apps. Access 2010 Web Services actually has a lot more features and is grander in scope than Access 2013, but it also has it’s limitations (and reporting never fully worked on Office 365 or BPOS) so it was scrapped and completely redesigned as Web Apps for SharePoint/Access 2013. Basically Access 2010 Web Databases are dead in favor of Access 2013 Web Apps. Hopefully this post will help inform you about their differences and help you pick which type of Access Web Database works best for your business. Unlike the 2013 web app which requires you to build an entirely new Access Application, Access 2010 Web Databases let you tweak an existing database to be Sharepoint web compatible so that you can publish them online. This means that if you have an older database with a bunch of useful client forms and reports, you can still get the entire file backed up and working online and while these client forms won’t work in the web browser, users will still be able to sync changes and use them if they open the database in Access. You also have the benefit of being able to supplement your Access database with browser based forms and reports as you build them in your 2010 app. Of course 2010 has it’s downsides as well. It does not allow the use of VBA code and as we’ve stated earlier, Microsoft has abandoned this idea of a hybrid Access application in favor of the easier to host model in 2013. The big change between these two technologies is the architecture and where the data is stored. Both 2010 web databases and 2013 web apps require SharePoint (although different versions) However, 2010 stores the tables and application in a custom SharePoint list type, while 2013 stores them in SQL Server tables. This change in architecture means that 2010 web databases are completely incompatible with 2013 web apps. If you create a 2010 web database there is no upgrade path to Access 2013. You cannot convert a 2010 web database to a 2013 web app. You can easily migrate your data (table structure and data) from a 2010 web database to a 2013 web app, but the application (forms, reports, etc) will all have to be rebuilt from scratch. That’s pretty much the problem with Access 2013 web apps to begin with. You have to pretty much start from scratch building all of your forms/reports in Sharepoint 2013. Both require SharePoint Access Services, but 2010 uses Access Services 2010 while 2013 requires Access Services 2013. These services are very different and incompatible. However, you can have both Access Services 2010 and 2013 running on the same SharePoint site so you can host both access 2010 web databases and 2013 web apps alongside each other. Lucky for you this is exactly what Access Hosting does with its Access Services 2010 and 2013 offering! So the bad news is that if you’re interested in building an Access 2013 App, you’re pretty much starting from scratch (other than saving your data and tables). You will have to build every new form and query for your 2013 Access Web App. Another setback is that Access 2013 does not allow for any reporting to be conducted in the browser – all reporting requires Access 2013 to be installed on a person’s computer and connected to the SQL table storing your Access Web App via ODBC. Here’s a helpful post about how to connect your web app to an Access 2013 desktop frontend. How to connect to your Access 2013 Web Database with SQL Server Management Studio 2012. If you’re starting a new Access project though, it makes sense to use the most up to date software and if you are an experienced Access Developer there’s a lot of tricks that you can do to use Access 2013 Web Apps to add browser functionality to an already robust app. By creating a client/desktop Access 2013 frontend and connecting via ODBC you can utilize VBA code and other more advanced functionality and while this functionality isn’t available in the browser you at least have the benefit of all being connected and using the same raw data and tables. If you’re interested in testing Access 2010 Web Databases or Access 2013 Web Apps, Access Hosting offers a free 30 day trial on servers that are running both services. Plans include 10 users and are only $99/month. Additional users and storage can be added to any of these base plans. Here’s a video demonstrating how to add new created Active Directory users (that paid hosting plan customers can request via our helpdesk) to your SharePoint 2013 and Access Services 2013 database. Access Hosting is proud to announce Managed Windows Dedicated Server Hosting for Windows Server 2012 and 2008 R2. Access Hosting offers the latest Hyper–V virtual dedicated servers based on Windows Server 2012. Now your virtual machine can be more powerful and resilient, and include incredible limits for processors, memory and storage. Each virtual dedicated server performs like a stand-alone physical server. Hosting plans are entirely customizable to your business needs, so please check out this link to learn more about Windows Server 2012 hosting or fill out the form below and we’ll get back to you with a pricing quote. We have been getting tons of requests from Access developers and DBAs about SQL Server 2012 (previously known as “Denali”) that need multiple databases and other more robust SQL 2012 options. Today we are pleased to announce the availability of Microsoft SQL Server 2012 Web Edition for $199/month. This is the latest installment of Microsoft’s popular database and it includes a number of improvements over previous versions. New improvements SQL 2012 include AlwaysOn for higher availability, Contained Databases to improve on some of the authentication challenges associated with moving databases and FileTables for those apps that manage unstructured data that lives as files outside of the database. Of course the big advantage of this plan to Access Developers is the ability to create an unlimited number of tables, databases and SQL user logins so that you can manage multiple clients, databases, projects and Access applications from the same secure cloud-based location. If you have any further questions, please check out our SQL 2012 webpage and feel free to chat online with a sales representative or contact us via email. Since SharePoint 2010 with Access Services has been released, we have gotten requests from customers looking to prevent users from opening their Access application. Many developers want the only user experience to be the browser based version of their application and our video tutorial hack is too limiting and simply not good enough. Well, as you can see from the picture above, we have finally figured out a way to remove the Options Menu (and subsequently the Open in Access option) from any Access Web Database. This customization has been widely requested and is yet another feature that Office 365 does not offer. Unfortunately because of how SharePoint 2010 was designed and coded, this customization requires that we alter SharePoint master pages and is therefore only available with a virtual private server. If you are interested in this feature, it is now available with any of our SharePoint Virtual Appliances which are only $499 and include 10 users and 5GB of storage space. How can I load my Access database into the remote desktop session? Can I have multiple concurrent users accessing the same database? Sure – if you purchase more than one instance of the remote desktop we can provide a networks storage location that can be mapped as a Z: (or any other letter) drive and used for the backend of your Access Database. We charge a one-time non-recurring $99 setup fee to create this mapped shared drive. How do I connect my Macintosh to the Access Application in the Remote Desktop? How do I connect my iPhone, iPad, Android Phone, or Android tablet to the Access Application in the Remote Desktop? How can I backup my Access database? We recommend that you regularly copy your database from your remote session to your local computer for backups, but we also provide automated backup to Amazon S3 storage for $20/month. Can I use a local printer? Yes. Any printers that are locally attached via on LPT port are fully supported. Printers that are connected via your local network or USB are also supported but need to be mapped into a local LPT port before they are visible to the remote desktop session. The command to do this looks something like net use lpt3 \servernameprinter /persistent:yes. Do this before connecting to the remote session and the printer should be visible. Can multiple users share a single remote desktop instance? Yes, but only one user can be connected at a time. If your users connect at different times during the day they can share a single remote desktop instance. You will want to purchase the maximum number of simultaneous concurrent users that you will need. New Low Cost RDP Hosting – only $29 per user! I was able to get my hands on a Blackberry Playbook today and had a chance to test our SharePoint service and Hosted Microsoft Access Databases. I am happy to report that the browser that the Blackberry Playbook uses seems to be completely compatible with SharePoint 2010. 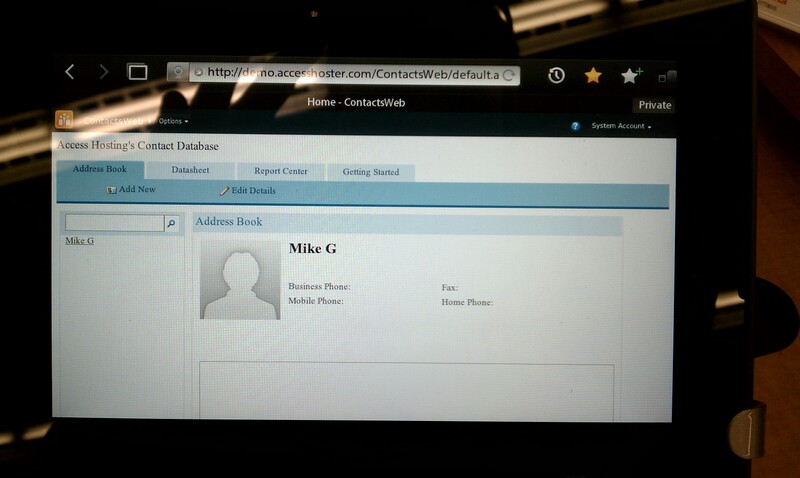 I was able to login to our demo site and load our Contacts Web Database right on the Blackberry Playbook. I took a quick snapshot on my phone of the database working on the Playbook. Very cool!